The day has finally arrived when you can bring your puppy home, and as exciting as this time is and should be, you do need to do a few things to make the transition into your home as smooth and as stress free as possible. Puppies are naturally very inquisitive and want to explore everything around them and this can get them into trouble. In short you need to puppy proof your home to make sure that your puppy cannot hurt themselves or wreak havoc in your home. Move and store any poisons out of reach and away from anywhere the puppy will be. This includes the obvious ones such as insecticides, rat and mouse bait and snail and slug poison, but it also includes common household cleaning products such as cleaning solutions, bleach, disinfectants, fertilizers and moth balls. One of the overlooked poisons to puppies is a chocolate stash within reach of a hungry puppy or even your own medication. This last one is especially important for owners of food driven breeds such as Puggles, Beagles and Golden Retrievers. Many of the plants, both indoor and outdoor, can be harmful to your new puppy. Some of the most dangerous are Lilies, Rhododendrons, Azaleas, Sago Palms, Castor bean plants and Elephant ears. Publishing a full list would be impractical to do here but if you click on this link to the ASPCA website ( http://www.aspca.org/pet-care/poison-control/plants/ ) there is a comprehensive list of poisonous plants and their photos. It is best to remove these plants from your yard or home but if this cannot be done, make sure you are able to supervise your puppy when they are around these plants. Get down on all fours and see the world from a puppy’s perspective to see what dangers lurk. Pick up any small objects that are small enough to swallow such as toys, buttons, coins, string, pins and other sharp objects, plastic bags and wrappers or any other tempting objects. Unplug, remove or cover and electrical cords that you can and remove any that are in areas that your puppy will have access to when unsupervised. Puppies chewing on these cords can receive electric shocks, mouth burns as well as the possibility of causing a fire. Also remove any double adapters or multiplugs that your puppy may urinate on or into for the same reasons. Most balcony rails and guards are designed to stop people from falling over the edge but puppies can often slip or squeeze through the gaps and fall to the ground. Keep your new puppy away from pools and ponds that are too deep for them to stand up in. Contrary to popular urban legends, not all dogs know how to swim. They can also suffer from hypothermia if they cannot get out of the water. 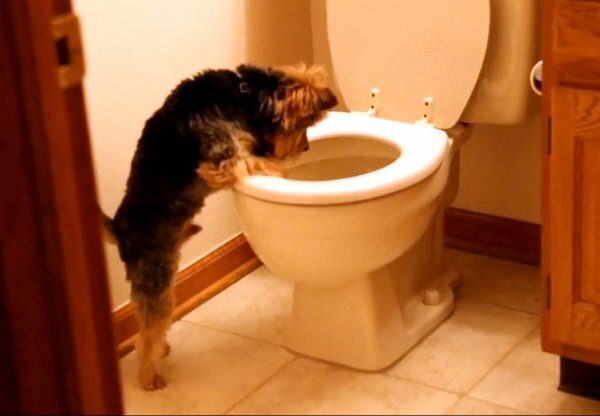 Believe it or not, the toilet bowl is a very tempting and exciting place to play and even drink from for some puppies and beside the unsanitary nature of the water in the toilet, they can also be poisoned by cleaning chemicals in the water. Puppies can also slip into the bowl when playing in the toilet and be unable to get out. This one is mainly to protect your possessions from being accidentally broken or damaged by and over-enthusiastic puppy as well as to protect your puppy from knocking heavy objects onto themselves. This includes moving any sentimental items such as photos or DVDs and any documents to avoid the clichéd “my dog ate my homework” conversation the next day! This entry was posted in New Puppy and tagged animals, dog, dogs, list of poisonous plants, new puppy, poisons, Puggle, Puggle puppy, puppy proof, toilet training by designerdoginfo. Bookmark the permalink.